As a former Miss Texas USA judge, I can affirm how competitive these pageants really are – and how much work goes into the effort by the beautiful women who compete. Produced by the Miss Texas Organization, the Miss Texas competition exists for the purpose of providing personal and professional opportunities for young Texas women and promoting their voice in culture, politics and community. The competition was founded in 1936 as a scholarship pageant and has evolved into what is recognized today as one of the best organized and well managed of all state pageants. The contestants competed in the following categories: private interview, lifestyle and fitness, talent, evening gown and onstage question. Miss Texas 2015 will compete for Miss America held in Atlantic City on Sunday, September 13 and broadcast on ABC. Miss Texas' Outstanding Teen 2015 will compete for the title of Miss America's Outstanding Teen in August in Orlando, Florida. 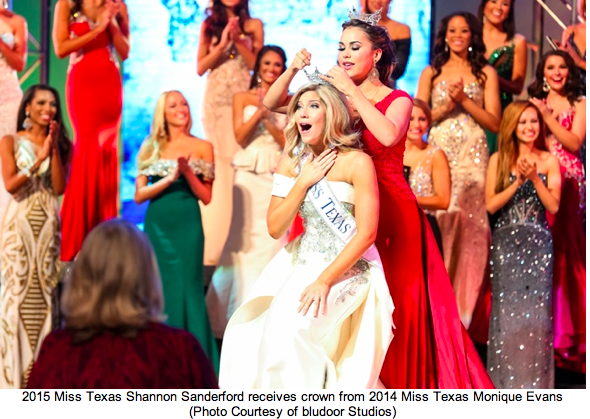 Miss Texas will receive a $15,000 cash scholarship and the use of an Infiniti from Grubbs Infiniti during her reign. In addition to competing for scholarships, each contestant actively participates in raising funds for the Children's Miracle Network, which is the national platform of Miss America. Miss Texas sponsors include Grubbs Infiniti, Dillard's, Adrianna Papell, DIOR, Renaissance Dallas Richardson Hotel, Skechers, Liland's, bludoor studios, Uptown Energy, Baseball Diamonds, Minsky Formal Wear, Mi Cocina and My Fit Food.